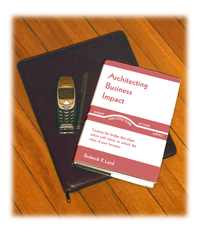 What "Executive Impact" is the working tite of a book on Architecting Business Impact. It is aimed at delivering the managers who own and shape businesses - the tools to effectively do so. This site makes the case for management teams to embrace Business Architecture as part of their basic skill set and every day management approach. Business Architecture is both a set of tools and concepts and a journey. Architecting Business Impact follows through with the insights and experience that allow management teams to craft their own journey. Part I explores the rationale or �Why do this?� for business architecture. And it introduces the backbone framework for the Impact Journey; the �Business Impact Architecture Framework� or Impact Bridge. Part II teases apart the Business Architecture component of the Impact Bridge. Its first chapter revisits what � for most management � should be the familiar territory of business strategy. It aims to help you harness and build on all your existing strategic planning capabilities � linking them specifically to the outputs required to drive a crisp, competitive business architecture. After a high level traverse of the components of strategy that drive Business Architecture, �dives down� to explore some exciting areas where taking an architectural perspective to your business can have you thinking differently about strategy! picks up the journey with the pragmatic translation from �is� to �to be� for every part of the business architecture. The grandest vision can fall by the wayside for the lack of a roadmap that focuses scarce resources � talent and cash � on practical priorities. An effective action agenda has to meet the twin hurdles of both encompassing all the activities critical to success � and a simplicity that makes it relevant for every person on whom it depends. These chapters address this challenge � and that of ongoing performance management of both continuing transformation and operations. concludes with some ideas as to how you might �cut the suit to fit your cloth� in terms of tailoring the process and participation to your unique business context and needs.